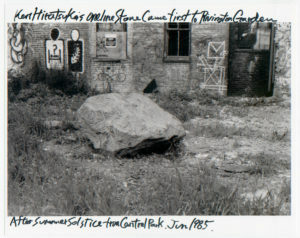 The Rivington School Sculpture Garden, 1985–1987. 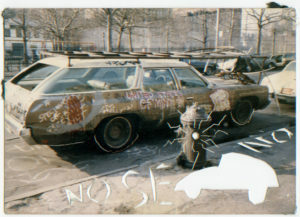 Two photos from a scrapbook page assembled by Linus Coraggio. 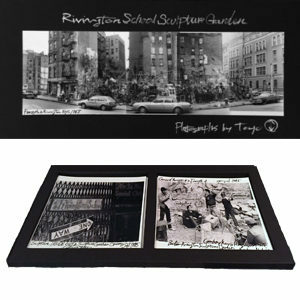 Last year’s publication of Rivington School: ’80s New York Underground (Istvan Kantor, ed. 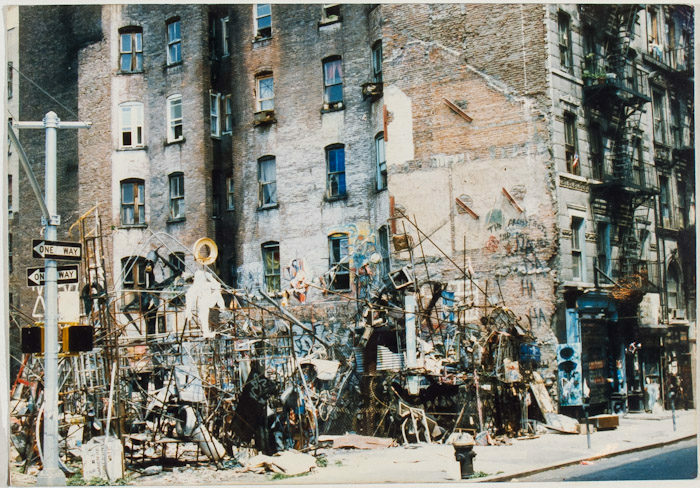 ; London: Black Dog, 2016) surprised many who thought they knew the history of art in downtown New York. 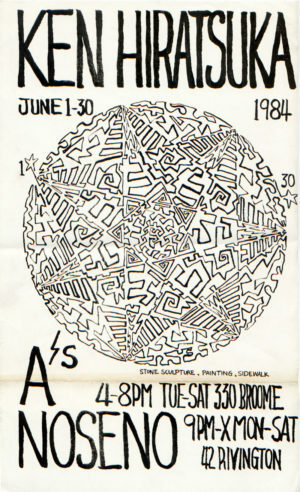 At the height of the Rivington School’s anarchic art activity in the 1980s, few critics were covering it. 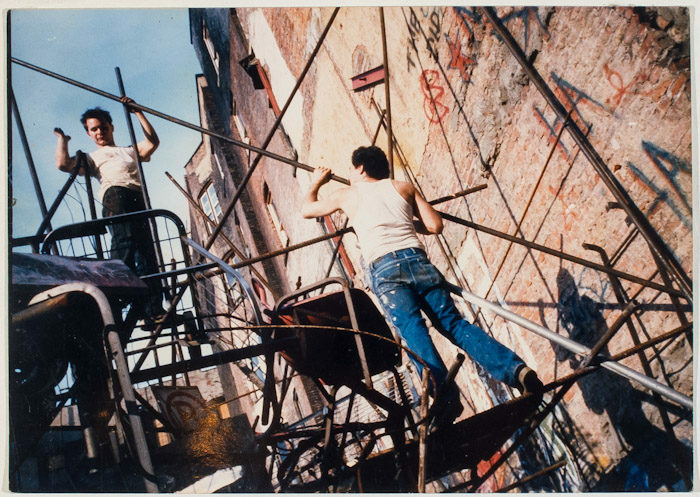 Decades later, the new book revealed the surprising appeal of the youthful, anti-commercial, anti-aesthetic, drug-and-alcohol-fueled creative tumult. 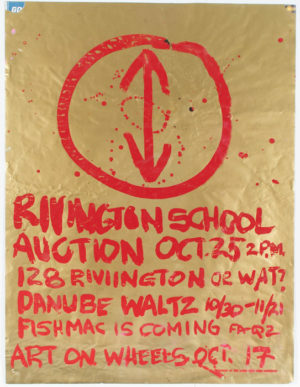 Its first printing quickly sold out, and the Rivington School suddenly looked like one of New York’s most authentic and interesting punk art strains. 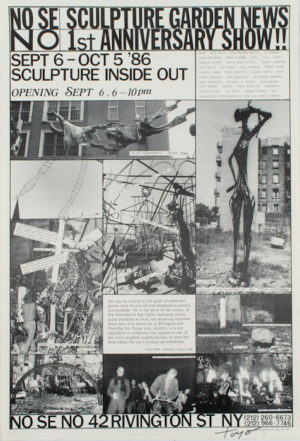 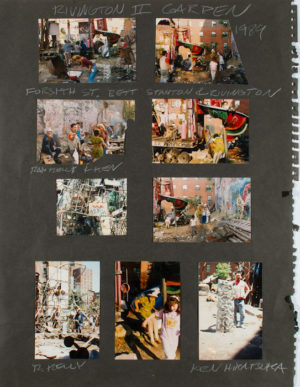 In 1985, No Se No artists took over the empty lot on the corner of Rivington and Forsyth, transforming it into a crammed, junkyard-like Sculpture Garden that would become the Rivington School’s best-known manifestation. 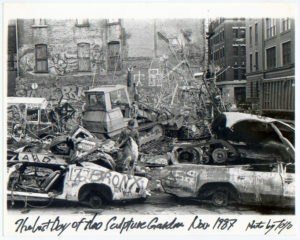 Over the next two years, the squatted Garden grew into a dense thicket of metal, incorporating all of the group’s wildest impulses, as sculptors chaotically added to it. 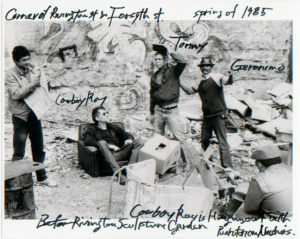 Lawless and threatening, the garden was destined to be demolished by police in 1987. 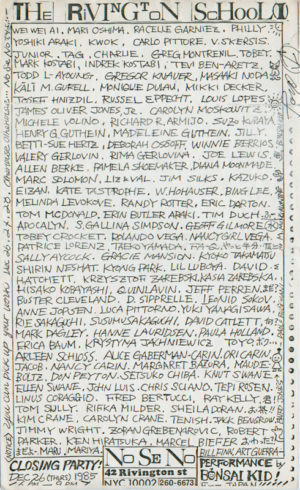 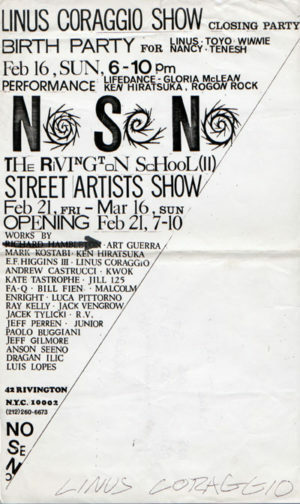 Gallery 98’s online exhibition spans the Rivington School’s first 13 years, from the opening of No Se No to the closing of the studio and exhibition space The Gas Station (1995). 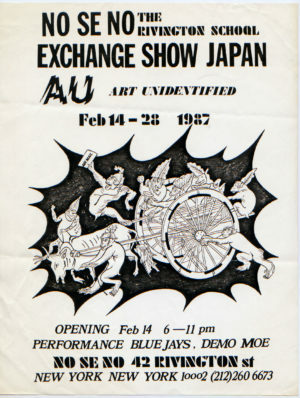 In creating this exhibition, we have worked closely with two key figures, Linus Coraggio and Toyo Tsuchiya. 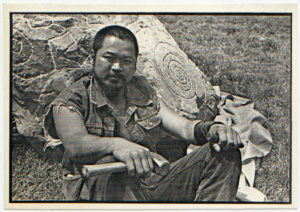 Other Rivington School artists also make appearances, most notably “Cowboy” Ray Kelly and Ken Hiratsuka. 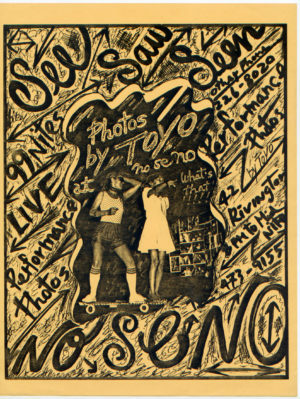 No Se No started hosting exhibitions in 1984, using the name “Rivington School” as both a reference to the abandoned schoolhouse across the street and a self-parodying bid for art-historical recognition. 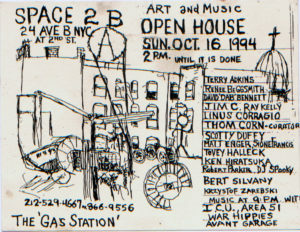 The name has since also been used for the art shown at the galleries Casa Nada (later just Nada) and Freddy the Dreamer, both of which opened in 1984 at 40 Rivington, next door to No Se No. 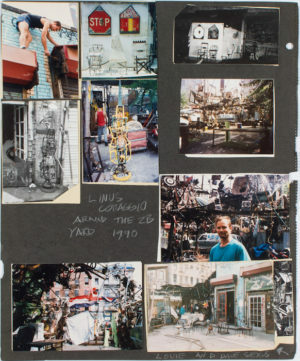 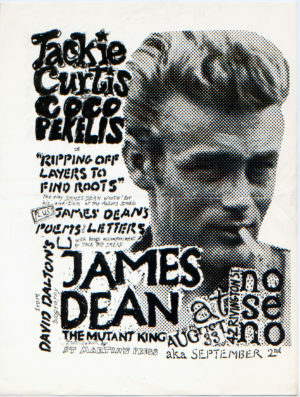 Linus Coraggio was a central player: an artist, mischievous instigator, and curator. 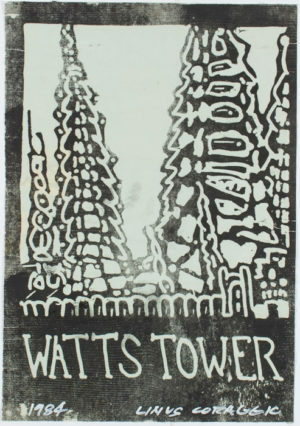 As a sculptor, Coraggio took inspiration equally from the abstract sculpture of David Smith and Mark di Suvero, from Simon Rodia’s massive Watts Towers in Los Angeles, and from the graffiti and street art that pervaded 1970s New York. 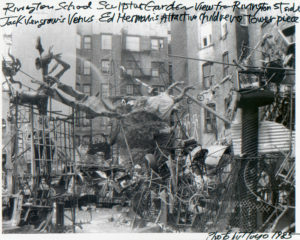 His street-metal aesthetic found its perfect expression in the salvaged-metal assemblage of the Rivington School Sculpture Garden. 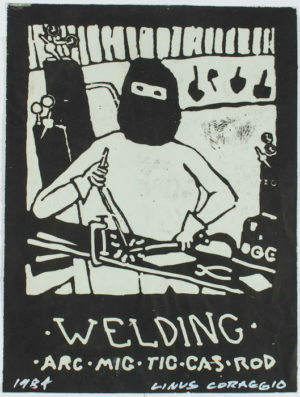 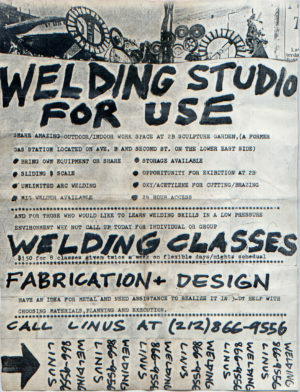 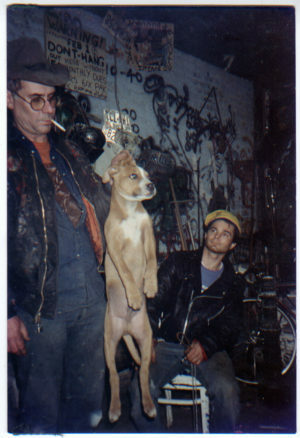 During the same period, Coraggio also transformed an abandoned gas station at Second Street and Avenue B into a “scrap-metal studio” and exhibition space. 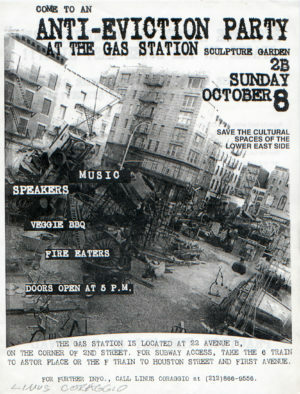 Variously called the Gas Station and 2B, the eccentric art space continued to embody the Rivington School aesthetic in the years following the destruction of the original Sculpture Garden (and its short-lived successor down the block on Forsyth Street). 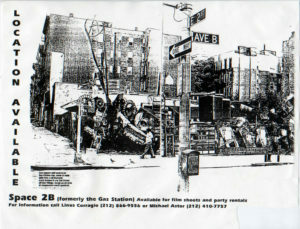 The Gas Station lasted most of a decade, but was demolished in 1995. 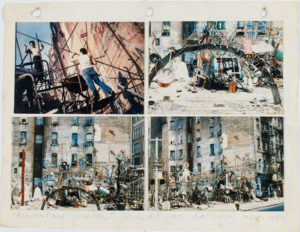 Toyo Tsuchiya, an outsider with a New York art dream, arrived in New York from Japan in 1980. 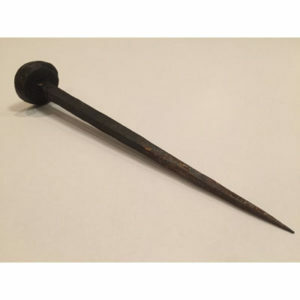 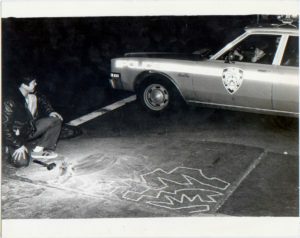 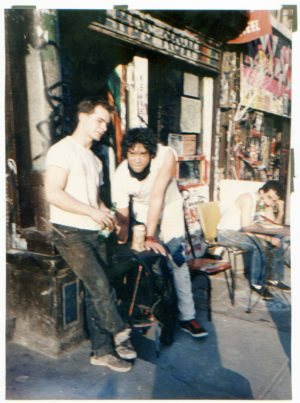 He made his way with the help of the Chinese artist Kwok Mang Ho, who ran the storefront Kwok Gallery on Mott Street. 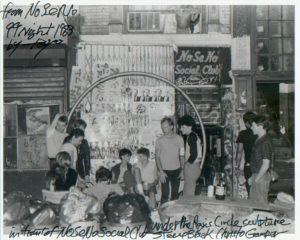 It was Kwok who brought Toyo to No Se No, in time for the opening of “99 Nights.” In Toyo’s words, “The strong pull of the underground art within those walls attracted me: exactly what I’d been seeking.” No Se No became a big part of his life, dominating his diaristic photography practice. 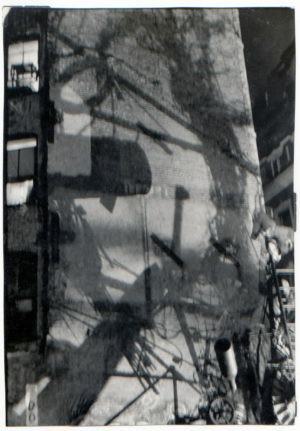 He shot each night’s performance, and mounted the photographs on the wall the following day. 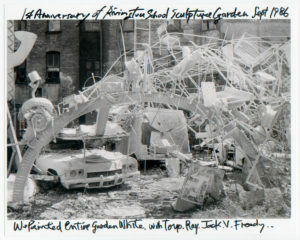 After “99 Nights,” Toyo turned his lens to the construction of the Sculpture Garden, whose first anniversary he marked by painting the entire structure white. 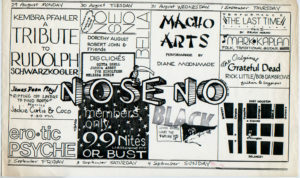 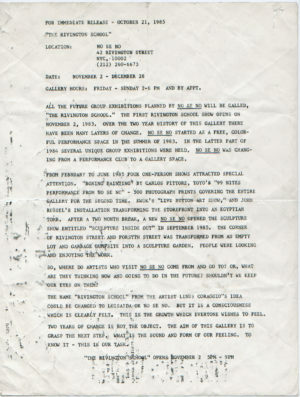 In 1985, he became one of the leaders running No Se No, designing posters and organizing (among other projects) an exchange between No Se No and the Japanese group Art Unidentified. 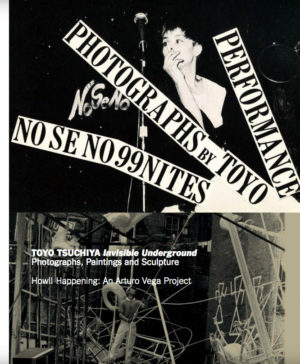 A highlight of this online exhibition is a newly created portfolio of Toyo’s Sculpture Garden photographs. 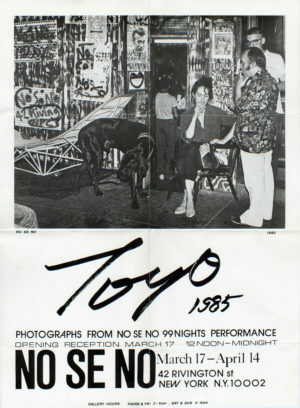 Toyo has signed and annotated each of the 13 digital prints, including a panorama on the portfolio cover that shows the lost landmark in its entirety.